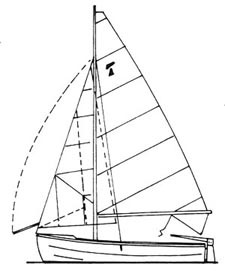 The Hartley 12 offers a 6ft 9 inches cockpit flanked by side decks and a small fore deck which provides ample room for the crew when sailing or fishing. The cover over the boom converts the cockpit into a level floored tent. Drawings also show a small easy to build cuddy if required. Plans are for plywood. Can take outboard 11/2 - 10 HP.